15 horns playing Oliver Nelson arrangements... Sold, to the man from the Daily Jazz. How could anyone fail to like a record that features a line up like this, especially when you consider the identities of both arranger and producer? There's so much to like before you hear it that you'd be forgiven for having my reaction when I first heard about this LP. "Where's the catch? ", I thought, "surely it can't be as good as it looks?". Oh, but it is, and then some. Anyone who knows Oliver Nelson's work with Jimmy Smith will be familiar with the music presented here. 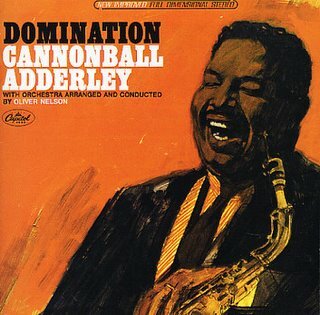 Huge stabs of horn serve as a backdrop to some excellent solo blowing by the brothers Adderley. Indeed, they really do come across like brothers here, able to read each others minds through some complicated traded passages, and playing perfectly in unison at breathtaking speed on many tracks. The listener is left gasping for more at the end of each track, so fine is the playing. The critics don't think much of this, but then they never did like music that was there just for the sheer fun of playing it. You get a real sense of fun here, that everyone was getting right into it. The ecstatic horn bursts of the two frontmen are enough to tell you that. Unlike some of the albums I review here, this one's actually been released on CD, so you all have no excuse for not getting your hands on this wonderful album.